Why buy literature holders for your business? These brochure and flyer displays are essential for growing companies. They are designed to help distribute pamphlets and marketing materials effectively. Our large selection of wholesale literature holders features countertop, wall mounted, and floor-standing designs. Some of these single pocket leaflet racks are dual purpose units that work both ways. 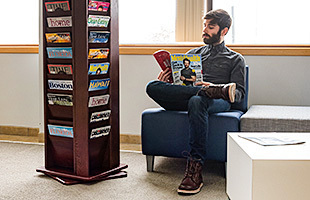 Easy-access literature holders provide a practical solution for organizing publications or periodicals. Pamphlets, leaflets, and flyers are printed with vibrant graphics for enticing potential clients. For this reason, affordable literature holders help increase brand recognition while expanding clientele. Each pamphlet pocket keeps prospective customers informed by supplying free information. 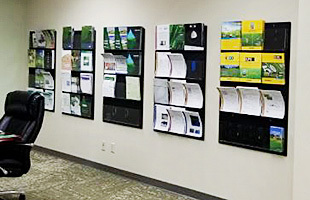 The literature and leaflet displays feature a "take-one" design that advertises promotions and product offerings. Organizations and businesses alike prefer to maintain orderly service counters and front desks. Why have literature scattered on a table or counter when you could easily raise it up to consumer eye level? Both vertical and angled pamphlet holders are available. Choose the style that will successfully target your clients. Countertop flyer displays are portable, so they can be moved from one advertising location to the next with ease. 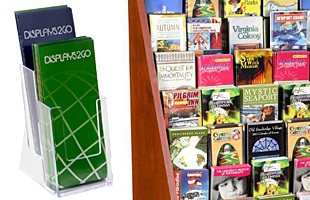 This style of pamphlet display is very popular among trade show vendors. The wall mounted pockets are more suitable for permanent use and are better suited for retail stores and business offices. What kinds of materials are used to manufacture the tri-fold literature displays? 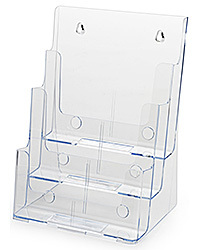 Molded plastic and acrylic brochure holders are some of the most popular styles our customers buy. These literature dispensers provide an excellent cost benefit for businesses with limited budgets. Our wholesale pricing makes it easy for large corporations to outfit all their locations with convenient bulk orders. Cardboard brochure pockets are another great buy for those looking to save. Not only are the cardboard models cheaper, but they also ship flat for assembly later. The compact design lowers the shipping costs, which results in even more savings for our customers. Several bright colors are available, so choose the pamphlet display that best accents your tri-fold literature. One of the newer lines is the wire flyer rack collection. These offer exceptional durability — yet won't break the bank. Black and silver metal holders for brochures are popular with those that require a portable solution. Trade show vendors and exhibitors continue to order these metal wire displays at an increasing rate. 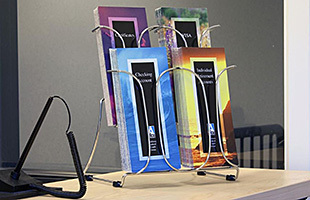 Wooden countertop literature holders are great for upscale offices, hotels, and restaurants. Any high-end establishment can maintain their elegant decor while offering free information. Wood pamphlet pockets are a safe bet when that warm, traditional touch is needed. Last but not least are our weatherproof, outdoor literature boxes. These dispensers are primarily used for real estate listings. Stores and businesses can also advertise after hours. The outdoor flyer boxes feature a lid that provides protection against the elements. No one should pay to replace their valuable flyers, pamphlets, and brochures when they can be protected so easily. Shop our vast selection of outdoor brochure displays to enhance your afterhours advertising strategy. 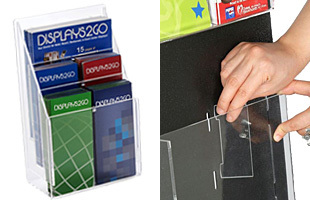 Installing a pamphlet holder helps convert curious shoppers into returning customers! Display product information or terms & conditions for a neat and professional presentation. Our unique inventory features a wide range of holders in other styles as well. Metal, MDF, and acrylic stands are for sale that have many pockets. 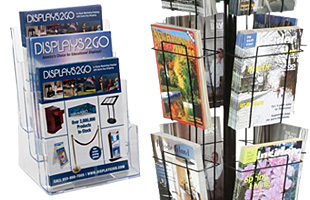 These multi-pocket racks for flyers are great for visitor centers, business lobbies, and other high traffic areas. The variety of brochure slots enables passersby to browse a whole selection of tri-fold publications or printed materials. Most are floor-standing systems but there are many hanging racks as well. These promotional products increase exposure in doctor & medical office reception areas, trade show event booths, bank lobbies, auto dealerships, real estate agencies, and other places that feature customer service counters. Browse the substantial selection of leaflet displays that best suits your application. In addition to these marketing products, we also offer a large assortment of sign holders and poster stands that make great "go-withs". Promote your business with professionalism and flair!